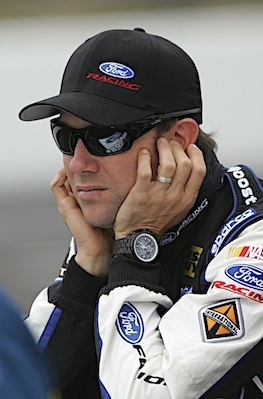 Roush Fenway Racing driver Matt Kenseth outdrove the field in the feature event at Slinger Super Speedway and earned his sixth victory at the Slinger Nationals. The victory set the record the number of wins by any driver in the 33-year history of the event, which is held in Slinger, Wis.
Kenseth’s win at the 200-lap event did not come easy however for the two-time DAYTONA 500 winner and NASCAR Sprint Cup Series Champion. Kenseth battled with fellow NASCAR star, Kyle Busch, as the duo led for a total of 175 of 200 laps. Some controversy came late in the race on lap 153, after a lapped car spun out in Turn 4 following contact with Kenseth’s No. 17. Initially race officials were going to send Kenseth to the rear of the field, but decided that he would restart in second since the lapped car had been warned to stay out of the leaders’ way. Busch had opted for the outside line for every restart and it worked in his favor until the final restart set up leaving only 24 laps in the race. Kenseth restarted on the bottom line since Busch restarted up top, and the pair raced side-by-side until Kenseth was able to edge his way to the lead. Once he was out front, Kenseth and his No. 17 machine built a one-second lead on Busch to cross the line as Sunday’s victor. Kenseth’s sixth win at Slinger Nationals set a record for the most wins in the super-late-model event’s history, breaking a tie with local Wisconsin racing hero, Lowell Bennett. Kenseth’s son, Ross also competed in Sunday night’s event, and finished third after running within the top five all race. Kenseth returns to NASCAR Sprint Cup Series action this weekend as the series travels to Daytona International Speedway where Kenseth and his No. 17 team look to once again have a successful run. Kenseth claimed victory at the 2.5-mile superspeedway earlier this season winning both the Gatorade Duel and the DAYTONA 500. Television coverage of Saturday night’s Coke Zero 400 begins at 6:30pm EST on TNT.